The Stokes brothers are political legends in Cleveland, Ohio. Here’s why. Though born as the great-grandsons of enslaved Africans, and raised in the impoverished Cleveland neighborhood of Central, Carl and Louis Stokes would grow up to become judges, political leaders, and history makers. As a high-school dropout, Carl Stokes would later join the army, work in foundry, and then complete high school, college, and law school before becoming Cleveland’s first Black mayor in 1967. And, in doing so, he would become the first Black mayor of a major metropolitan city in the United States. In the mayoral race, Carl defeated the grandson of President William Taft and overcame a city population that was ⅔ white in order to secure his victory. He would later serve in the Ohio legislature and preside as a municipal judge. In 1962, Stokes became the first Black anchorman of a television show in New York. Later, he’d return to Cleveland to work as general counsel for the United Auto Workers. Some of Carl Stokes’ most notable political accomplishments include creating “Cleveland Now!” – a public/private partnership providing community resources, and advocacy for civic participation and against voter apath. He opened City Hall jobs to Blacks and advocated for poor communities and racial unity. In addition, he was a staunch advocate for community-oriented police divisions, a dream that may be realized through recent consent decrees promulgated by the U.S. Department of Justice. 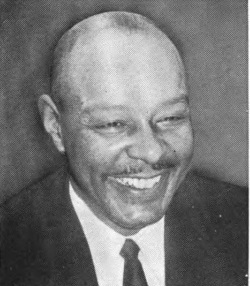 His brother, Louis Stokes, was also a leader of “firsts.” In 1968, Louis was elected as Ohio’s first Black congressman and served 30 years in the U.S. House of Representatives. As a crusading civil rights attorney, Louis argued against redistricting that would suppress the Black vote, as well as the iconic Terry v. Ohio “stop and frisk” case in 1968. In opposing this ruling, Louis grew attached to the case because he had been subjected to this unjust treatment that continues to exist today. As a Congressman, Louis helped found the Congressional Black Caucus and chaired special investigations into the assassinations of both John F. Kennedy and Martin Luther King, Jr. Together, the Stokes brothers left an indelible impact on both Cleveland and the nation. Carl Stokes was mayor during the infamous Cuyahoga River fire in 1969, when an oil slick caught fire in the long-polluted Cuyahoga River – causing $100k in damage and fueling environmentalist and pollution activists to respond. For this and other reasons, Cleveland “became a symbol of environmental degradation,” of which both Carl and Louis Stokes responded. Their advocacy and urge for greater federal involvement in pollution control helped push forward the federal Clean Water Act of 1972. Through August 2017, the city of Cleveland will celebrate the legacies and achievements of the Stokes brothers through programming, dedications, and special events. In recognizing the 50th anniversary of Carl Stokes’ mayoral election, the Jack, Joseph, and Morton Mandel Humanities Center is leading community partners in celebrating their monumental legacy and impact on the city of Cleveland. In the area and wanting to get involved? Check out the full year’s events here.